What's a Puff Drink Recipe? Well, an old fashioned "Puff" is a mixed fancy beverage containing one or more kinds of flavoring syrup with whipped cream or ice cream or whipped white of egg all shaken well together. Carbonated water is injected or poured into the mixture in quick dashes (spurts) to create added effervescence, and a maraschino cherry is often added before serving. Puffs are traditionally served in a tall glass with a spoon and without straws. Oh, and did I mention that they taste absolutely delicious? These amazing beverages come from the days of the pharmacy soda fountains and are quite similar to old time cream sodas. They result in a carbonated soft drink that's easy to make and goes down creamy smooth. If you're looking for refreshing non-alcoholic drink recipes, these are truly unique. Relive the days of the pharmacy soda fountain. Try the vintage puff drink recipes and treat yourself and your friends to the taste of an old fashioned soft drink. One-half ounce of ice cream beat up with 1 ounce of a favorite syrup; then slowly fill the glass with carbonated water. An ounce of softened ice cream is then put in around the top of the glass by using a silver tablespoon. This piles the thick creamy soda mixture up in the center. Price, 10 cents. To make the strawberry syrup: 2 pounds sugar, 1 pint cream, 1 pint water, 4 ounces strawberry juice. Mix, bring to a boil, cool, then add a few drops of vanilla extract. Pour into a punch bowl and cover partly with very stiff whipped cream. Drop a few strawberries on the cream. Serve 2 ounces of the syrup in a soda glass, and fill to nearly full with soda water, using the fine stream. Top off with whipped cream and a strawberry. Price—10 ounce glass, 10 cents. Pour 1 ounce of the syrup of the flavor desired into a 12-ounce glass and half fill the glass with carbonated water. Pour another glass of the same size half full of charged whipped cream, and pour the contents of both glasses together until mixed. Place in a glass the white of one egg, sweet cream, 2 ounces, and whip well. Then add chocolate syrup, 1-1/2 ounces. Shake well, fill with carbonated water, pour into a 12-ounce glass, and serve without straws. 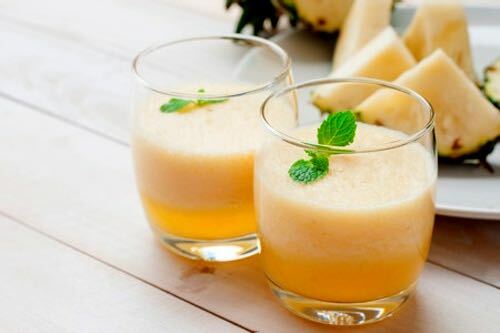 Into a mixing glass containing 2 ounces plain, sweet cream, add 1 egg white, beat with a spoon until well whipped, add 1-1/2 ounces pineapple syrup, transfer into shaker, and add carbonated water from both streams; then pour from shaker to 12-ounce glass and serve without straws. Charge 10 cents.